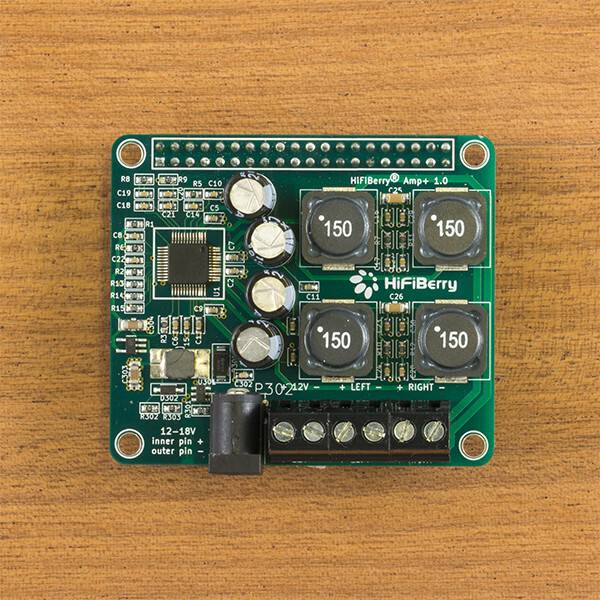 The HiFiBerry Amp+ is a high-quality, highly efficient Class-D power amplifier for the Raspberry Pi. Mount it onto your Raspberry Pi and you have a stereo audio system. You only have to connect your loudspeakers. It’s the ideal building block for multi-room audio installations. The HiFiBerry Amp+ is a high-quality, highly efficient Class-D power amplifier for the Raspberry Pi. Mount it onto the Raspberry Pi and you have a stereo audio system. You only have to connect your loudspeakers. It’s the ideal building block for multi-room audio installations. Raspberry Pi compatibility: The Amp+ works with all Raspberry Pi models with the 40-pin GPIO connector.